At one time, Arizona was internationally known as a respite for those suffering respiratory difficulties. With ailments ranging from allergies to asthma to tuberculosis, patients flocked to the area for relief. According to the association's "State of the Air 2005" report, over 2.6 million, or 79%, of the county's residents are at high risk for respiratory complications due to air quality. Among those at risk are residents with asthma, bronchitis, cardiovascular disease, and diabetes. For the most part, the Brown Cloud consists of tiny particles of carbon and nitrogen dioxide gas. These substances are deposited into the air mostly from burning fossil fuels. Cars, construction-related dust, power plants, gas-powered lawn mowers, leaf blowers, and more contribute to the cloud daily. While other areas around the country have similar fossil fuel usage without the obvious after-effects, the location, weather conditions, and rapid growth that attract residents and visitors to this area also help trap those particulates and gases. At night, an inversion layer forms over the Valley. As with any desert, the air closer to the ground cools faster than the air above. However, unlike most other deserts, the cool air then moves in on top of the warm air westward from the surrounding mountains. As a result, the air trapped closer to the ground in the Valley, the air containing the majority of the pollutants in the area, spreads. As the desert floor heats up during the day, the particulates rise, forming a visible haze that expands as the day progresses. Throughout the day, air shifts in the Valley cause variances in the Brown Cloud. From mid-day on, the cloud is pushed to the east. With every sunset, the cycle starts all over again. In March 2000, Governor Jane Hull formed the Governor's Brown Cloud Summit, a committee of local politicians and business people, dedicated to restoring the Valley's air to its once pristine clear blue. Chaired by meteorologist and ex-State Senator Ed Phillips, the Summit examined this issue for ten months. According to the Brown Cloud Summit's final report, the process described above not only obscures the once clearly visible mountains surrounding the Valley, it also contributes to higher than average incidents of health problems, especially respiratory ailments including allergies and asthma, leading to higher than normal mortality rates from heart and lung diseases. The Summit concluded that only a cooperative solution would reduce or eliminate the Brown Cloud. First, Phoenix area residents must understand the causes and effects of air pollution. Then, in cooperation with local businesses and elected officials, they must reduce the introduction of pollutants into the air through voluntary and regulated methods. Private citizens and business owners can take action by, for instance, reducing traffic through telecommuting, carpooling, and encouraging and/or subsidizing the use of public transit including the upcoming light rail system in Phoenix and surrounding communities. Other measures include repairing and retrofitting vehicles with more efficient emissions controls or alternative fuel systems and purchasing cleaner running vehicles for business and government fleets. Auto manufacturers have responded to the demand for "greener" vehicles by producing hybrids which can run on electricity or gasoline, and cars powered by compressed natural gas (CNG) or biodiesel made from renewable resources such as vegetable oil and soybeans. Research into using hydrogen fuel cells which emit only water vapor is underway ​but is not expected to result in a practical, affordable passenger vehicle for several years. Mandatory regulations also play a role in reducing area pollutants. Stricter vehicle and industrial emissions have been enacted over the years to comply with the Summit's recommendations and federal Environmental Protection Agency (EPA) rules. Heavy industry has been tasked with reducing smokestack emissions. Farmers and construction companies must meet ever more stringent dust control standards to keep particulate levels down. 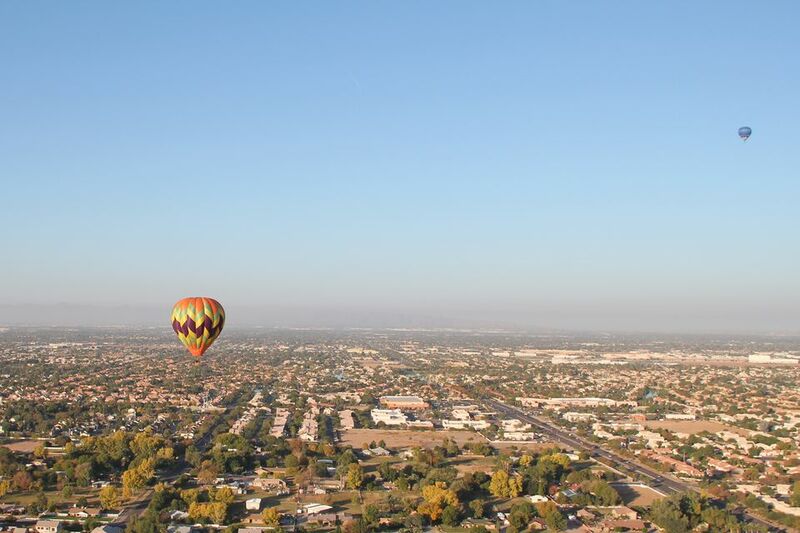 Has Phoenix Air Quality Improved Since 2000? According to the EPA, the Phoenix area's air was improving during the past few years, but the agency issued Maricopa County a "Notice of Deficiency" in May 2005 for repeated violations during the preceding months of federal air quality standards set forth in the 1990 Clean Air Act. While data is still being reviewed for 2005, in 2004 Maricopa County racked up 30 such violations. As a result, the EPA has mandated that the area's particulate pollution must be cut by at least 5% per year based on current levels. Those cuts will be enforced until the federal agency is satisfied certain health standards are met. Local officials have until late 2007 to present their plan to the EPA to meet those new standards. Maricopa County officials called 2005 "the worst for air quality in memory" according to a January 2006 report in the "Arizona Republic." Arizona Department of Environmental Quality (ADEQ) Director Steve Owens said the air pollution during the winter of 2005 was "kind of like the Brown Cloud on steroids." According to the recently formed Maricopa County Air Quality Department, the worst offenders contributing to the area's most recent downturn in air quality appear to be housing developers who paid hundreds of thousands of dollars in fines for dust and permit violations during the past year. Manufacturers, trucking companies, and many others have also been fined by the department for a variety of infractions. In addition to regulating industrial polluters, County officials are reaching out to citizens of the area to do their part in cleaning up the air. Recommendations include keeping cars tuned up and running properly, reducing and combining trips, using public transportation, and refraining from using wood stoves or indoor fireplaces during high pollution advisories, also known as "no-burn days." Residents can call (602) 506-6400 anytime for messages in English and Spanish outlining up-to-the-minute wood burning restrictions. Additional regulations may be considered for Maricopa County including stricter enforcement of vehicle and industrial emission standards and dust regulations along with extending no-burn bans to outdoor wood fires. Cities may consider imposing restrictions on leaf blowers and other sources of particulate pollution not already being regulated. In the meantime, Valley residents and visitors will continue to deal with the health effects of the Brown Cloud by doing what they can including staying indoors during the region's all too common air quality advisories and visiting their doctors or hospital emergency rooms when breathing becomes a chore. In the early 20th century, the Valley of the Sun's clean air was a miracle cure for those with respiratory ailments. While the area may never be as pristine as that again, it can become cleaner in the 21st century with the help of the area's residents and businesses. That will help everyone who calls the area "home" breathe a lot easier.